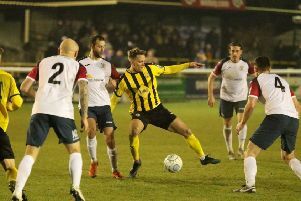 Brakes’ winless National League North sequence extended to ten games with Tuesday night’s narrow defeat to Stockport following on from a 1-1 draw at Boston on Saturday. It threatens to undo all the hard work of November which saw Brakes waltz through the month unbeaten in both league and cup competitions. But despite not having tasted a league win since November 20, Holleran says the challenge of mixing it with a string of former League clubs and established non-League heavyweights is one to be relished. “The league is relentless,” said Holleran. “But this is what we worked so hard for and what we want. “It would be easy for me to be a decent side at Step 3, plodding along around the play-offs. “Or, do you want to be in the best part-time league in the country? “We’ve played two ex-League teams in the last few days and we’ve gone 1-1 and 1-0 with depleted teams. “Stockport are a big, strong, powerful side and we matched them for long periods. “You couldn’t argue that they weren’t the better side on the night but we could easily have got a 1-0 or a 1-1 and it’s been like that the last few weeks. Despite having to go back to November for their last maximum, Brakes have lost only three of their last ten and Holleran is still in a positive frame of mind ahead of the visit of Altrincham tomorrow. “Having everyone available is key for us,” he said. “We’ve got a run of games now when we can get some positive results. n Holleran has moved to cover for the injury Kieran Dunbar sustained at Boston by signing West Bromwich Albion youngster Sam Wilding on loan.